Gambia with its capital Banjul is located in Africa (Western Africa, bordering the North Atlantic Ocean and Senegal). It covers some 11,301 square kilometers (slightly less than twice the size of Delaware) with a population of 2,051,360. English, Wolof and Fulah are the languages spoken by people in Gambia (consider regional differences). As an interesting fact, Senegal is the only bordering country. Gambia is a country in West Africa and is the smallest country on the continent of Africa. It has a short North Atlantic Ocean coastline in the west and is surrounded by Senegal so that it is almost an enclave. The country occupies the navigable length of the Gambia River valley and surrounding hills. Gambia is becoming a popular vacation destination for Northern Europeans. Therefore, many charter and holiday operators offer reasonable airfare and accommodation if desired. The topography is flood plain of the Gambia River flanked by some low hills. The average density of population is about 182 per km². The climate in Gambia can be described as tropicalhot, rainy season (June to November), cooler, dry season (November to May). Potential natural disasters are droughts. To reach someone Gambia dial +220 prior to a number. The local cellular networks are operated on 900 MHz, 1800 MHz, 3G, 4G. Websites typically end with the top level domain ".gm". If you want to bring electric appliances (e.g. battery chaarger), keep in min the local 230 V - 50 Hz (plugs: G). The sign for the locally used currency Dalasi is GMD. 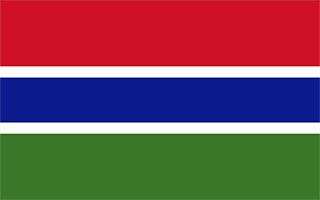 Three equal horizontal bands of red (top), blue with white edges, and green; red stands for the sun and the savannah, blue represents the Gambia River, and green symbolizes forests and agriculture; the white stripes denote unity and peace.